I wake up each morning excited to get to work as the Headmaster of Krieger Schechter Day School. 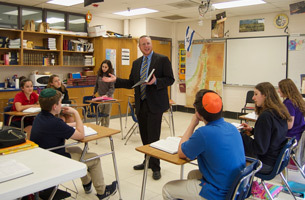 When greeting our young, eager, curious students, I feel awed by their energy and potential, humbled by the responsibility of providing them with a first-rate Jewish and secular educational experience, and excited to oversee a school that prides itself on ensuring that each and every child gets the most out of his or her education. Krieger Schechter incorporates best practices not only on the individual student level but on a state and national level as well. Our talented faculty and staff get to impact the life of a child each and every day. We are providing meaning in our students’ lives and through them engaging the lives of their entire family. Our Board of Trustees consists of dedicated lay leaders who work tirelessly to ensure that our school provides excellence every day and will thrive for years to come. As a Krieger Schechter parent as well as its head of school, I’m doubly privileged to experience the magic of our school. Ever since moving here in the summer of 2015, the Schechter community has embraced my family in ways I could not have imagined. My wife Aviva and I not only feel at home with our warm and supportive Schechter family, we are also thrilled to see our own three children receive an outstanding education in a safe and nurturing environment. Each is thriving in his or her unique way, gaining life-long skills, developing meaningful friendships with wonderful peers that will last a lifetime, and becoming an inquisitive learner and confident risk taker as a writer, scientist, computer programmer, social media guru, athlete, prayer leader and so much more. With open arms, I encourage you to step into our building. Come and see the magic that takes place each and every day in our school. I am confident you will feel the same energy that inspires me: Fabulous teachers working with terrific students. You’ll see it in the classrooms, around the building and on our amazing playground. You will also see it in the Greater Baltimore community and beyond where our alumni are thriving, innovating and making the world a better place. Unparalleled engagement takes place in a multitude of settings, both formal and informal. Krieger Schechter is a school for parents who want their children to be outrageously successful, generous and happy adults and knowledgeable and involved Jews. Come join our community. You’ll be glad you did.